He was The Legal Genealogist‘s cousin, that David Davenport of North Carolina. 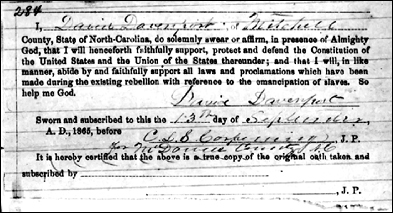 The petition of David Davenport a citizen of Mitchell County, State of North Carolina aged forty six years, by occupation a farmer, respectfully Showeth unto your Excellency, That he held the Office of Post Master at Spruce Pine Post Office in said County, under the so called Confederate States. The holding of which office, according to your Excellency’s proclamation, deprives him of the privilege of taking the Oath of Amnesty. Your petitioner would further show that he did not accept said office for the purposes of aiding the rebellion; but that he accepted it to keep out of the rebel army and for no other purpose. Your petitioner would further show that he has ever been a Union man and opposed to the rebellion, that he rejoices at the restoration of the Union that it is his desire and ever has been to live a loyal and faithful citizen of the United States. Your petitioner does therefore pray that Your Excellency will duly consider his case and he humbly asks Executive Clemency. Your petitioner as in duty bound ever prays. And, of course, it worked. By then my cousin had already signed the required oath — as you see here — and all was hunky dory again between David and the Union. Ever a Union man, right, David? Those contributions to the Confederate cause may or may not have been totally voluntary. Once, maybe not voluntary. Twice, even. Three, four, five times plus a team and driver in another state? Come on, now. You need more evidence than that to prove this thesis one way or the other. There was much coercion that went on in subtle and not so subtle ways. Subtle coercion, for sure. But at some point assistance crosses the line from coercion to cooperation. I don’t know where the line is, exactly — despite what my nieces and nephews say about my age, I wasn’t there 🙂 — but there’s certainly enough to put this into the “maybe not so much a loyal Union man” category. From yesterday’s blog, I have a question. Did these amnesties prevent these men from getting state-sponsored confederate pensions? Not that I’m aware of. Each state had its own rules for who was eligible and who wasn’t, but I haven’t seen a single statute where acceptance of amnesty or a pardon was an issue. Well, I took a look at Mitchell County. I see that it is in the western part of the state, up in the mountains. A quick and dirty search revealed that the northern part of Mitchell county was a Unionist hotbed. I know from other research that I’ve done that the mountain regions of western North Carolina, northern Georgia, northern Alabama, western Virginia and eastern Tennessee had a lot of unionist sentiment. One interesting thing to look at is how those counties voted on secession referendums and ordinances. I remember a few years ago when I was in Raleigh they had a nice display about Unionist in North Carolina. The heaviest concentrations were in those western counties. Now, this doesn’t mean your man was a Unionist, but it does show the environment in which he lived. Perhaps, he was one of those who changed his allegiance depending who was winning at the time, or how the political winds of local politics were blowing. You man could have been a died in the wool Confederate, who lied about it to get his amnesty. Or, he might have been a Union spy, who had to make it look like he was a “true believer” in the Confederate cause. Or, somewhere in between these two extremes. All I’m saying is that based on your documents, you don’t have enough information to say definitively one way or the other. I think we’re saying the same thing, in the long run. My point was his assertion that he was ever a Union man has to be taken not just with a grain of salt but with a whole salt lick — looking all the entirety of the record and not just his petition for a pardon. His months and months of supplying materials and men to the Confederacy have to be factored in as well. Yes, I agree those documents have to be factored in. And, on their face they make a strong case. I just think that, as Paul Harvey used to say, things might look different if you knew, “the rest of the story”! The emphasis here is on the word “might.” Last year I read several books dealing with southern unionism and one factor that ran through all these tomes was the deception practiced by Unionists to hide their true feelings from Confederate authorities. Also, one book, about northern Alabama, listed occupations often desired by Unionists was that of postmaster, because it was one of jobs that made a person exempt from the CSA draft. This sounds sooo much like the Revolutionary War in New Jersey where, if the truth were known, I suspect a great many of the residents would have preferred to have simply been left alone by both sides. One wonders how many of the residents ever collected what they were owed according to those vouchers handed out by the Continental army. The British didn’t even bother with vouchers, they just helped themselves to whatever they wanted. Westchester County, NY was even worse. That became a no man’s land where neighbor fought neighbor, brother fought brother, and scorched earth was the rule. I expect that may have happened during the Civil War as well, especially places like Kansas and Missouri which had already seen violence before the south seceded.